For part two of the Soups for Cold & Flu Season series, I'd like to share my personal favorite-Phở Chay (aka. vegetarian Vietnamese noodle soup). If your sinuses are congested, make sure not to skimp on the hot peppers or chile garlic sauce; the spiciness thins mucus and will help clear out the congestion. This soup is packed with nutrients, easy-to-digest carbohydrates, and hydrating broth--perfect for when you're feeling under-the-weather. If you missed part one, check out: Soups for Cold & Flu Season, Part I: Wild Rice and Mushroom Soup . 1. Make broth: In a 4-quart sauce pan, combine stock and spices (cardamom, licorice, ginger, cinnamon, star anise, cloves, coriander seeds). Simmer together, covered, for 15-30 minutes. Add soy sauce to taste (usually a couple of teaspoons) and whole mushrooms; simmer another 5 minutes. Use a slotted spoon to remove mushrooms and set aside to use as a garnish. 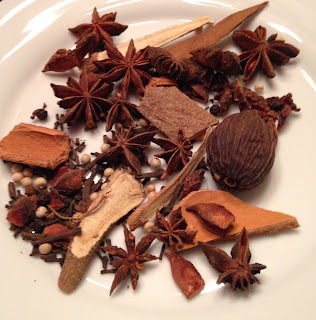 Strain broth to remove spices then return to heat to keep warm for serving. Add tofu and broccoli (if using) to the broth 1-2 minutes before serving. 2. Make noodles: While the broth is simmering, place noodles into a large bowl with warm water and soak 15 minutes. Then drain noodles and place into a pot of boiling water for 3-5 minutes, or until al dente. Do not cook until completely soft. Drain. If you are not serving them immediately, run cold water over the noodles to stop the cooking. 3. Prepare toppings: While the broth is simmering and the noodles are soaking, prepare the toppings as directed above. Set them all out on a large platter so that each person can add toppings of their choosing. 4. Serve: Portion out 2 cups of boiling hot broth into each of 4 serving bowls (use large soup bowls). Divide the noodles between the bowls. Everyone can then add toppings of their choice at the table. Hoisin and chile garlic sauce are used to season the soup once all of the other toppings are added. Hoisin gives the soup a salty, savory, umami flavor. Chile garlic sauce adds spiciness, and of course, garlic. *Tip: You can often find a packet of spices for phở at markets with an extensive selection of Vietnamese ingredients. If using a spice packet, use enough spices for 4 servings and omit the cardamom, ginger, peppercorns, licorice root, cinnamon, star anise, cloves, and coriander seeds from the recipe. So glad I found you! Read your story, in Hoda's book. Thought I was eating healthy and doing great about exercise. Then GERD,along with possible IBS, AND possible Lactose Intolerance were diagnosed, upon my 62nd birthday.I skipped further testing, for confirmation. So restrictive a diet. Will you have guidance for such issues? Look forward to learning more! Thank-you, Michelle Hauser! Btw..my relatives have the Hauser last name.